After going for years without electricity, residents in the rural community of Sonkombo in the Ndwedwe Municipality in KwaZulu-Natal on Tuesday celebrated having their lights switched on for the very first time. Two thousand households in the area were overjoyed to finally enter the modern era of electricity as KwaZulu-Natal MEC for Cooperative Governance and Traditional Affairs Nomusa Dube-Ncube turned their electricity on as part of the department’s R19 million local electrification project. Sihle Zikalala, a member of the KwaZulu-Natal provincial legislature and who comes from Ndwedwe, was present at the switching on ceremony. According to the department, one resident, 65-year-old pensioner, Zibuyisile Ngcobo, said that she had begun to fret about the continued lack of electricity in the area. “I was getting worried that I might die without ever having electricity in my home,” she said. Dube-Ncube called on residents to look after their electricity infrastructure and report any suspected electricity theft because it “impacts on the government’s ability to expand electricity to other communities”. 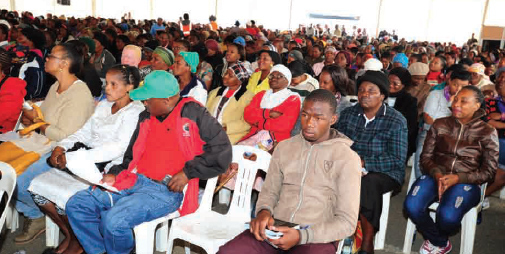 She told the community that it was now their responsibility to ensure they used electricity wisely and that “no one makes any illegal connection or tries to bypass the meters because the money you pay goes towards ensuring that Eskom continues to produce electricity”.